Termed differently due to the differing dialects in Bangladesh, this dish is relatively easy but can be a little messy due to the frying. Any type of fish can be used but there is one particular fish containing a lot of bones that is most often fried this way. 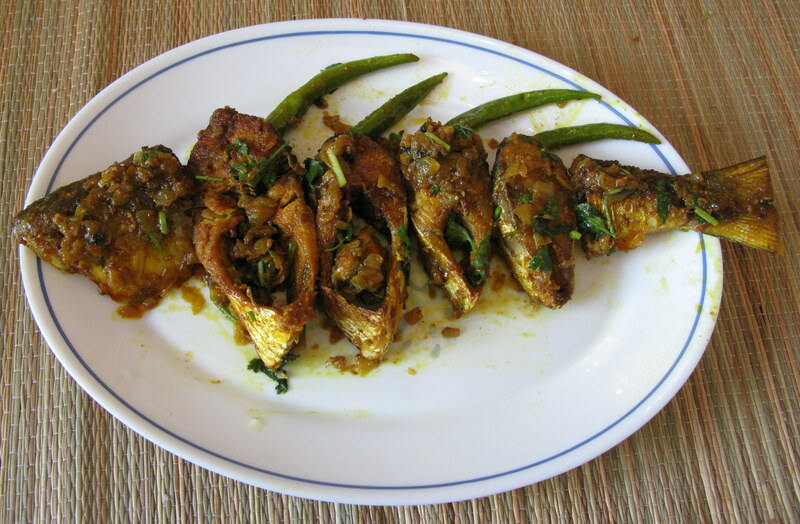 This is called Ilish and/or Hilsha and unfortunately since it is a traditional bangladeshi fish, there is no English equivalent that I am aware of. (If anyone knows, please email me and let me know). Spices: 1/2 tsp chilli powder, 1 tsp turmeric, 1 tsp cumin, 1 tsp coriander. 1/2 tsp salt (or salt to taste). 1. Cut and clean the fish and soak it in a little salt water for about 15 minutes. 2. Drain and pat the fish dry. 4. Mix the ingredients together using your hand. Be wary of the bones. 5. In a pan, heat up about 2-3 tablespoons of oil. Note: You don’t need too much oil now since you already used it in the preparation stage. Then again, you don’t want too little, incase the fish sticks to the pan. Use your judgement. 6. When the oil is fairly hot, place the fish carefully into the pan and fry till crispy. 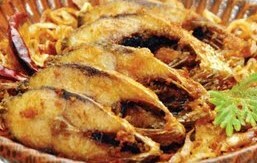 Note: due to nature of this dish, you’ll want to fry the fish until the bones are crispy. 7. Once the frying is done, set aside the fish pieces on a dish. 8. Slice the onion finely. Using the oil that is left in the frying pan, fry the onions until they turn brown. You want the onions to be crispy and not soft. Add the green chillies and fry along with the onion. 9. Scatter onions and chillies over the fish and serve while hot. Recommendations: Best eaten with white basmati rice or sticky (glutinous) rice found in most Asian stores. Can also be eaten with brown rice as a healthier option. If you wish to make this dish with any other type of fish such as Tilapia, Haddock or Cod, prepare in the same way but no need to soak in brine. Is there any Ilish Mach restaurant in London.Please inform. I’m really not sure. I don’t live in London. You could perhaps ask the question on ask.com or other similar sites. Hi. I love your site. This response is a little late–2016. There is an awesome Balti/Bangladeshi restaurant in Richmond near London that is owned and run by Sylheti Bengalis. I discovered this restaurant quite by accident while going for a walk. I was only a visitor to the UK and have not had the good fortune to return to the restaurant. But I remember their food and the friendliness of the owners–when they found I was a Bengali from Kolkata. I have forgotten the name specifically, but it could have been either Bengal Village or Sylhet Spice. Hope this helps! Thanks for this, I substituted Hilsha with Basa fillets (white fish, no bones to deal with and readily available in UK supermarkets, fry from frozen) and the recipe work fine. Paired with basmati rice and tadka dhal – delicious!